MiniCamCap(webcam recorder and monitor) Core Features: 1) Face detection: detect faces and take photos, which can be sent to a specified email address. 2) High compression rate: only 1-3GB hard disk space is needed for 24 hours of continuous video recording. 3) Can Automatically start recording after system reboot. 4) "Cyclic" recording: if the space is almost full (free space is less than 0.5GB), automatically delete the oldest video files. 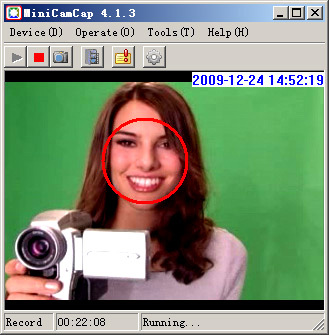 MiniCamCap(webcam recorder and monitor) is Webcam Recorder and Monitor. * Can minimize itself to the system tray or be hidden completely. * Add caption and time stamp to your video, take snapshot, adjust brightness/contrast, etc. What webcam video formats are supported by MiniCamCap AWR? (352,288),(320,240),(352,240),(352,576),(576,480),(528,384),(720,480),(720,576), (720,486),(480,272),(480,576),(420,240),(640,360),(640,400),(800,448),(800,450), (800,500),(800,600),(854,480),(960,544),(960,720),(176,144),(160,120),(720,428), (656,368),(656,492),(680,460),(704,396),(720,408),(400,240),(720,428),(240,320), (176,220),(480,320),(800,480),(288,352),(240,320),(240,352),(576,352),(704,288). Because XviD Codec does not perform well in 640?�480 size, the frame size 640?�480 not supported by MiniCamCap. Capture streaming video and snapshots. Is the easiest and fastest way to record MSN webcam steams to your PC. Qweas is providing links to MiniCamCap(Webcam Recorder and Monitor) 4.7.5 as a courtesy, and makes no representations regarding MiniCamCap(Webcam Recorder and Monitor) or any other applications or any information related thereto. Any questions, complaints or claims regarding this application MiniCamCap(Webcam Recorder and Monitor) 4.7.5 must be directed to the appropriate software vendor. You may click the publisher link of MiniCamCap(Webcam Recorder and Monitor) on the top of this page to get more details about the vendor.